Tour de Trash is back for its 21st year with six tours that visit various waste management sites and businesses on Oahu. This year features the familiar Recyclers and Waste Processors, Wastewater and a favorite Green Business tour. The Construction and Demolition tour will also be back for a second year in a row. A brand new Reuse tour with new partners has been added to shine a spotlight on source reduction, donation and repurposing of usable material as a preferred method to recycling or disposal. The always FREE Tour de Trash allows participants a behind the scenes look at how trash, wastewater and recycling is handled on Oahu. The goal is to raise public awareness to help facilitate better public discussions and decision-making on recycling and waste management initiatives. Register by phone: 768-3200. Choose from the scheduled tours below. The recyclers and waste processors tour follows the path of our opala from the blue, green, and gray carts to their respective sorting, composting, and waste-to-energy facilities. This tour is a great introduction to the City’s main solid waste programs and starts off with a visit to the City’s H-POWER waste-to-energy facility, where all of Oahu’s trash is incinerated to generate electricity. H-POWER is capable of processing up to one million tons of trash per year; providing Oahu with up to 10% of its electricity needs – 70 megawatts of power, or enough electricity to power 60,000 homes. The tour also stops at RRR Recycling Services where all of the City’s curbside blue cart material is received and processed. Tour goers will follow the recycling stream through the elevated sort line and see how paper, plastic, metal, and glass are separated and prepared for shipping to overseas end users. At Hawaiian Earth Recycling (HER) participants will see how yard waste from the curbside green bins is recycled into mulch and compost. HER staff will explain the science behind the composting process; from mulching and open air windrow management to screening and mixing their final product. At Waimanalo Gulch Sanitary Landfill tour goers will learn about the environmental protections employed by today’s modern landfill including its complex liner, leachate catchment, and methane recovery systems. Follow the flush on the Wastewater Management tour to find out what happens to the water that’s washed down your sinks and toilets. The tour visits the Honouliuli Wastewater Treatment Plant, where 25 million gallons of sewage per day are treated through screens, filters, and clarifiers which clean and separate liquids from solids. The tour then travels to the Honouliuli Water Reclamation Facility, where the Board of Water Supply further processes the wastewater into cleaner water which can be used for irrigation. Collection System Maintenance will provide a live on-site demonstration of how sewer pipes are serviced and maintained using a robotic Closed-Circuit TV camera and a Vactor truck. Start/Finish: Hawaii Convention Center- 1801 Kalakaua Ave.
On the Green Business tour, participants will get a behind the scenes look at the Hawaii Convention Center’s exemplary sustainability programs including food recovery and donation system, mixed material recycling collection system for offices and events, as well as the energy and water efficiency equipment and measures they’ve implemented throughout their facility. Gyotaku Japanese Restaurant will showcase how it captures food waste, which is recycled into animal feed, and used cooking oil, which is converted into bio-diesel. Whole Foods Kahala will show off their recycling programs and sustainability initiatives, such as food donation, reusable shipping containers, and energy and water efficiency measures. Businesses participating in this tour have received the Green Business Award from the Hawaii State Energy Office, Department of Business, Economic Development, and Tourism. Learn more about these recognized businesses by visiting the Hawaii Green Business Awardees Page. This brand new tour will feature organizations that are doing their part to reduce our waste at the source. Part of their work includes salvaging or accepting donations of construction material, tools, appliances, furniture and other home goods to be refurbished, resold and reused. Re-Use Hawaii is a nonprofit organization established in 2006 whose mission is to reduce waste through alternatives to demolition from public donations of building materials. They redistribute these materials to the community as an affordable resource. They also work to deconstruct instead of demolish buildings in order to salvage the reusable material. The Salvation Army is an international organization that came to Hawaii in the 1890s. Their mission is to aid in providing for the material, emotional and spiritual needs for those requiring assistance. At their headquarters, we will see how they provide housing and work for those in need, receive truckloads of donations from around the island, sort, refurbish, distribute to their other thrift stores and resell the items to help support their cause. Honolulu Habitat for Humanity is part of a global, nonprofit organization that seeks to eliminate substandard housing through constructing, rehabilitating and preserving homes. Their ReStore section is a home improvement store and donation center that sells new and gently used furniture, appliances, building materials and home accessories to the public at a fraction of the retail price. Proceeds raised at ReStore go towards supporting their mission of providing housing for those in need. On the Construction and Demolition (C&D) Recycling tour, see how companies give C&D material a second life by transforming it into new usable forms. Learn how Island Demo deconstructs buildings, recycles the metals, and cleans and grinds concrete to be used as aggregate. West Oahu Aggregate recycles concrete, rock, and asphalt for resale and screens and converts dirt into topsoil. At PVT Landfill, the majority of the incoming C&D waste is separated, processed for reuse or recycling. Much of the waste at PVT Landfill is planned to be used as feedstock for a gasification process that will produce electricity. Same as Tour 1, but conveniently offered on a Saturday to make it easy for teachers and students to attend. Others are welcome to join however preference will be given to those in the education system. At the conclusion of this tour, buses will return to Kapolei Hale where City recycling staff will be available for questions about the tour and discussion on the City’s solid waste management and associated educational programs. Staff will have several of the City’s recycling educational resources available for distribution, including student activity books and recycling reminder stickers. Additional Tour Information: Participants must be 12 years old to attend. Under 18 years old must be accompanied by an adult. All tours, including site-to-site transportation, are FREE. Space is limited and reservations are made on a first-come basis. Please consider your reservation a binding agreement to attend. A no-show is a seat we could have given to another participant. Tour does not include lunch or refreshments. Please bring water and/or snacks. Keep in mind that the Tour de Trash is designed to give participants a behind-the-scenes look at some of Oahu’s largest and most dynamic recycling and waste processing facilities. The sites may be dusty and dirty. Some of the tours have participants climbing several flights of stairs, walking through narrow corridors and standing outside for extended periods of time. Please inquire with City Recycling Branch staff about the amount of physical activity involved in each tour. For tours 1, 2, 4, 5 and 6, please arrive at Kapolei Hale 15-20 minutes prior to departure. Parking is free in the public lot or on the street. For tour 3, please arrive at the Hawaii Convention Center 30 minutes before departure time. Parking at the Convention Center will be validated. All tour buses depart promptly in the morning on schedule; tour end times are approximate. Tour sites are subject to change. Call 768-3200 to register. The City is able to coordinate custom tours for school groups, solid waste advisory committees, technical associations, visiting professionals and other such groups. Custom tour participants must provide their own transportation. Please call 768-3200 for more information. Join HTY on March 2 and 9 at 9:30am or 11:30amfor their public performances of Trash & Treasure. This brand new show, built specifically for audiences 3-6 years old encourages kids to think about their trash in a new way. The show will also reach about 2,700 students during their weekday performances to help spread their message even further. The Department of Environmental Services is proud to be a collaborative partner on this play, which will help kids learn about the value of rubbish. The interaction with performers along with their singing and dancing will keep audiences entertained while introducing concepts of reducing, reusing and recycling. For more information, call 839-9985 or visit www.htyweb.org. Hazardous waste generally includes flammable, corrosive, reactive, poisonous or toxic material. Find out what is considered hazardous and what items can be safely disposed of at home on our opala.org Household Hazardous Waste page. Next dates for 2019: May 4, July 6, September 7, November 2. The holiday season in Hawaii means food, gifts and celebrations with family and friends. For most residents, this means a greater volume of recyclables to sort and trash to dispose of. Follow these tips to reduce, reuse and recycle in order to minimize the amount of waste this year. Eat all your leftovers or cook them into new dishes. Check out our Food Waste Reduction Guide for recipes, tips and tools for using up what’s left. Donate quality edibles to Aloha Harvest or Hawaii Food Bankto help those in need. Bring reusable containers to take home leftovers instead of using disposable ones. Wrap gifts with reusable or recyclable material-like cloth, newspaper or paper bags. Bring your own reusable Bags when doing holiday and grocery shopping. Send e-cards instead of snail mail. They’re cheaper, faster and reduce waste! Recycle the corrugated cardboard from your boxed gifts. Collect and recycle beverage containers from your parties and get some cash back for a special gift for yourself. After the season ends, recycle your Christmas trees in your green cart or at a City Convenience Center. Remove all tinsel and decorations and cut the tree to fit in the cart. **Remember: No trash or recycling collection and all City drop-off facilities will be closed on Christmas Day, December 25 or on New Year’s Day, January 1. 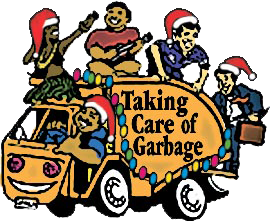 Visit the the opala.org Holiday Trash Tips page for schedule information and other holiday collection rules. Next dates for 2019: March 9, May 4, July 6, September 7, November 2. Join us for our Backyard Composting Workshop in August! Sign up now for our “Backyard Composting: Nature’s Recycling” workshop at Pearl City Urban Garden Center on August 11th! This FREE beginner workshop teaches you how to turn yard trimmings and food scraps into soil enriching compost. Learn the basics, familiarize yourself with the tools and find out what type of backyard system is best for you through this interactive demonstration. More workshops to come! Composting improves soil fertility, texture, structure, aeration, water holding capacity and erosion control. It also stimulates healthy root development and decreases the volume of our waste stream.